This weeks Tuesdays With Dorie was chosen by Sharon from Simply Southern. 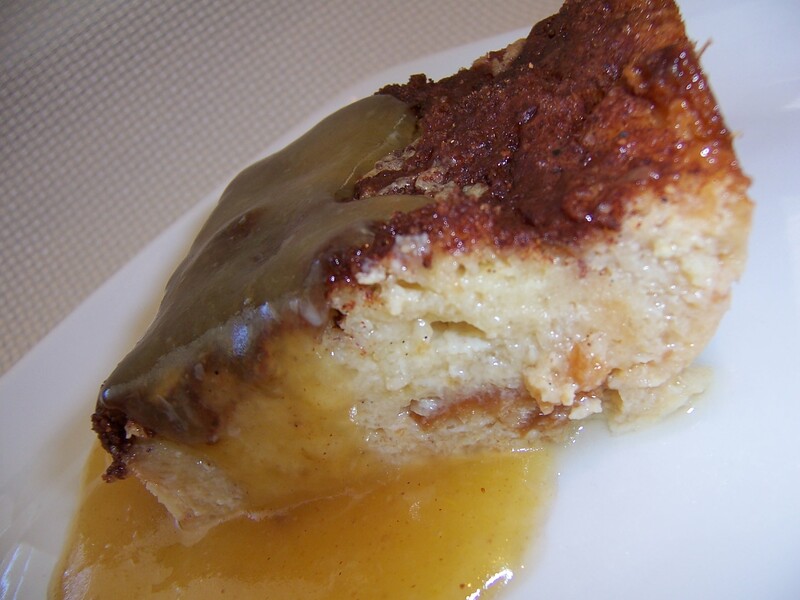 She picked Dorie’s Bourbon Bread Pudding which is located on page 407 in Baking: From My Home to Yours. I can’t state this enough, I love bread pudding. Mike always seems to think it takes like French Toast which I guess it does since it is pretty much almost the same way we make French Toast. But sometimes it matters what type of bread pudding you are having: does in have a bourbon sauce (yummy), is there a baked meringue on top (yummier), and both just make it super yummy. This turned out super fantastic. I wish I would have made a bourbon sauce to go with it but since all the bourbon doesn’t burn off and I am currently sustaining life for myself and my symbiote, I decided that that might be a bad idea and opted for Vanilla Ice Cream (not pictured). This weeks Tuesdays with Dorie was hosted by Elizabeth of Cake or Death?. 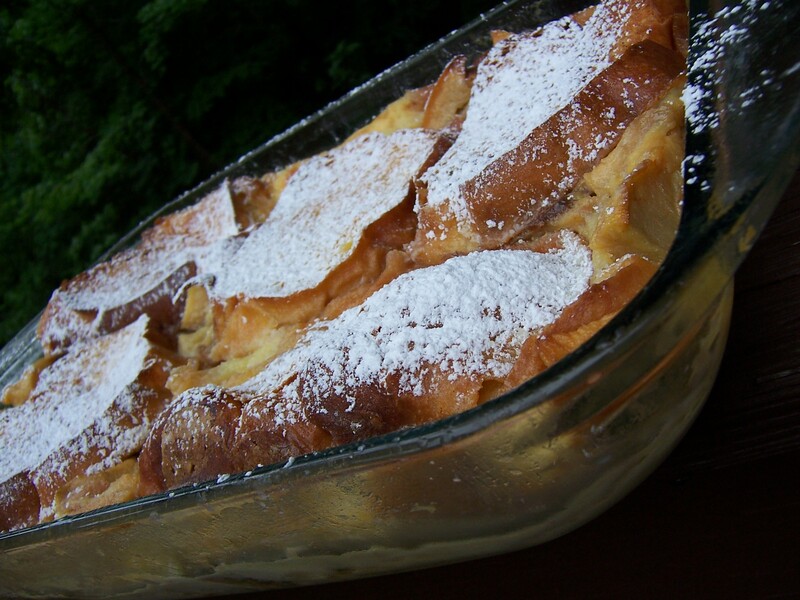 She chose Dorie’s Apple-Apple Bread Pudding which is located on pages 408-409 in Baking: From My Home to Yours. Okay, so if you didn’t already know I LOVE bread pudding, especially if it has a bourbon sauce with it 🙂 I guess it just brings back memories of my childhood. Wait, not the bourbon but the bread pudding. If it was bourbon that would be an interesting childhood, that I possibly couldn’t remember. So, I was a little excited when we were given another chance to make bread pudding. Like all bread puddings, this was really easy to put together. Almost like an Apple-Apple sandwich (sauteed apples and apple butter). I decide to forgo the water bath because I didn’t want to take the time to drag out the roasting pan that is at the bottom and back of the pantry. So, I just lowered the oven temperature to 300 °F and baked it for 1 hour and 25 minutes, and it turned out perfectly. I cut a tiny sliver off the bread pudding this morning, so that I could try it because there was noway on earth that none of this was going in my mouth. It was apply and soft, but I think it was missing something. Wait I think I know…a huge scoop of ice cream ::day dreaming:: and BOURBON SAUCE. Also I think a nice addition to this recipe would be raisins, possibly soaked in Cointreau. All in all, this was a great dessert that I am sure my husband will be enjoying for breakfast for the next few days. For this recipe I actually modified the recipe and the instructions a little. I soaked the raisins in Cointreau for 30 minutes to an hour to give them a slight orange flavor and who doesn’t like oranges and chocolate together. Also, any bread pudding that I have ever made I mixed everything together in a bowl and then let the bread soaked in it for 30 minutes. After the thirty minutes the mixtures is then poured into a buttered casserole dish and baked without a water bath. The final product actually turned out really good. The bread pudding actually reminded me of the flavor of chocolate pudding. I served it with whiskey sauce and whipped cream. Melt the butter over low heat. When it is hot, but not colored, add the confectioners’ sugar and whisk constantly until thick. When it is very thick and hot, remove from the heat and whisk in the beaten egg until emulsified, about 2 minutes. Whisk in the bourbon and serve warm. My Kugelhopf sat on the counter for almost a week and I kept meaning to make French toast with it. 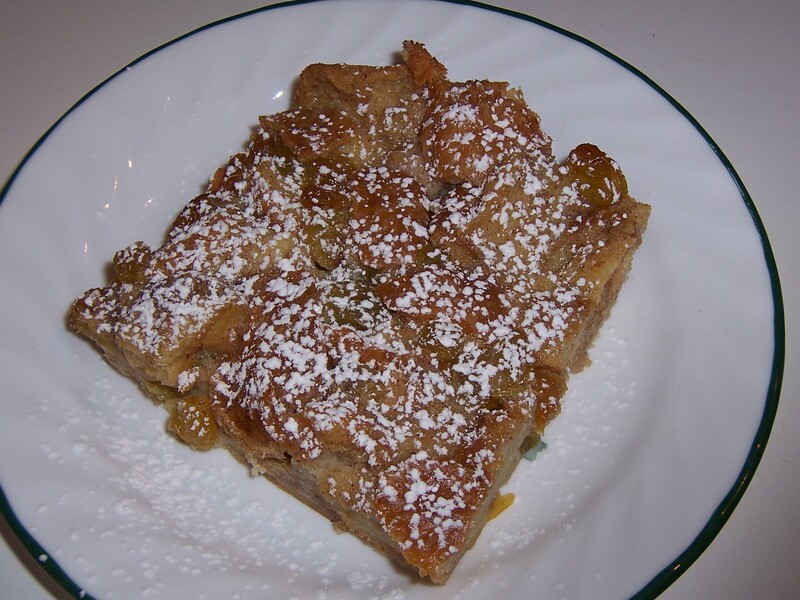 I haven’t had bread pudding in awhile and I miss it. I had all the ingredients and figured to go for it. Little did i know that it had to bake for 1 hour and 30 minutes and that I would fall asleep on the couch and wake up to the oven beeping at me at 4 in the morning. I decided to make the Bourbon Sauce in the morning once I had gotten more sleep. The Bread Pudding turned out FANTASTIC.